Queen of the South - The General Screw Steam Shipping Co. Ltd.
Machinery: 8ooh.p. Inclined 2 cylinder direct action 56x56x54 made by Maudslay, Field & Co. 10 knots. 4 Boilers. 2 Engines. Length of stroke 4ft 6inches. The screw, 15 feet diameter with 17 feet pitch turn at 60 revolutions per minute. The blades of the screw are feathered so as to throw them on a line with the keel, so not to impede the sailing of the ship. Decks: A magnificent saloon on the upper deck, and below the berths were arranged fore and aft along nearly the entire length of the ship to the number of 130. Registered: No.157 on 21st May 1852 in London. Other info: Certificate granted 1st January 1852. Pierced for 26 32-pounders and 2 large pivot guns. Had a Collard's pianofortes for the passengers. She cost about �,000 to build the ship. To carry 120 passengers. History: 15th May 1852. Trail trip down the Thames. 10th June 1852. Sailed from the East India Docks for Plymouth. Captain George Hyde. 15th June 1852. Sailed at 16�hrs from Plymouth, Captain Hyde, for the Cape of Good Hope and the East Indies. Captain Lowe, of Her Majesty抯 ship 慖mpregnable�, made an official inspection of the ship. He was satisfied with the condition of the ship and the efficiency of the crew, and expressed his strong approbation of Captain Hyde抯 bill for fire quarters, and of his new plan for lowering boats. These have ringbolt抯 fixed to the keel, and a rope rove through them fore and aft; the slings are hooked on to the rope, which has a seizing in the middle, and, should any difficulty occur in lowering, the seizing is cut, and the boat, thus cleared, drops instantly into the water. 16th June 1852. Arrived back in Plymouth due to running into bad weather 100 miles out. 20th June 1852. Sailed from Plymouth for Calcutta. She had on board specie to the value of fifty to sixty thousand pounds, a general cargo, and about thirty passengers. After having been taken out of dock in her Majesty抯 dockyard at Devonport it was determined to make a trial trip before her final departure for the Cape. 21st June 1852. She was taken round the Eddystone by Captain Lowe, R.N. the superintendent of the mail packets at Plymouth, who went out in her, having expressed himself satisfied with the vessel, she left at half-past three, under the charge of Captain G. Hyde. 30th June 1852. Arrived at Cape Verde. 2nd June 1852. Sailed from Cape Verde. 12th July 1852. Arrived at Ascension Island, spent eight days coaling. 29th July 1852. Arrived at Table Bay. 1st August 1852. Sailed at 02.30hrs for Mauritius. 13th August 1852. Arrived at Port Louis, Mauritius. Her arrival was considered as a great national event. 15th September 1852. Sailed from Calcutta. 21st September 1852. Sailed from Sand Heads having been detained by the tides. 26th September 1852. Arrived at Madras. 2nd October 1852. Arrived at Point de Galle. 12th October 1852. Arrived at Mauritius. 14th October 1852. Sailed from Mauritius. 18th October 1852. Broken off one of the fans of her screw-propeller. 20th October 1852. One blade of her screw was carried away � the other being so much injured as to require the engines being worked very gently. 25th October 1852. She was put under canvas and reached Simon抯 Bay under half steam. 29th October 1852. Arrived at Cape Town. 6th November 1852. Sailed from Cape Town. 15th November 1852. Sailed from St. Helena. 19th November 1852. Sailed from Ascension. 29th November 1852. Sailed from St. Vincent. 13th December 1852. Arrived at Plymouth at 10 a.m. She brings 100,000 rupees from India for the Oriental Bank. 31st December 1852. In the graving dock at Southampton to have her bottom coated with Peacock and Buchan抯 composition, and to be fitted with a new screw propeller in consequence of the damage to the old one during her last voyage home. 25th January 1853. At Southampton Docks undergoing repairs. 2nd February 1853. Completed a refit and went out on a trial trip just out of Southampton. Average speed of ten miles an hour. 13th February 1853. Due to sail from Southampton for Plymouth. Captain Hyde. 14th February 1853. Sailed from Southampton for Plymouth. Captain W. H. Norman, with 73 passengers, �,000 in specie and about thirty tons of general cargo. 16th February 1853. Sailed from Plymouth for the Cape of Good Hope. 27th February 1853. Sailed from St.Vincent. 7th March 1853. Sailed from Ascension just as the 慍alcutta� arrived. 20th March 1853. Arrived at Cape Town. 23rd March 1853. Sailed from Cape Town. 7th April 1853. Sailed from Mauritius with passengers, mails and cargo from the 慔ydaspes� due to engine brake down. 14th May 1853. Sailed from Calcutta for England. Captain Norman, with 67 passengers, plus a full cargo consisting of 83 bales of raw silks, 63 cases of manufactured silks, 449 chests of indigo, 2,237 bags of saltpetre, and other merchandise. 19th May 1853. Sailed from Calcutta, with fifty passengers. 26th May 1853. Sailed from Ceylon. 6th June 1853. Sailed from Mauritius. 18th June 1853. Arrived at the Cape. 21st June 1853. Sailed from the Cape of Good Hope. 30th June 1853. Arrived at St. Helena. 26th July 1853. Due to arrive at Plymouth from Calcutta. 30th July 1853. Arrived at Plymouth. 3rd August 1853. In Southampton graving dock to be coated with Messrs. Peacock and Buchan抯 preservative composition. 15th August 1853. Sailed from Southampton for Calcutta, Captain Norman, in place of 慔ydaspes�. 17th August 1853. Sailed from Plymouth. 29th August 1853. Arrived at St. Vincent. 8th September 1853. Arrived at Ascension. 28th September 1853. Put into Saldanba Bay, being short of coal. 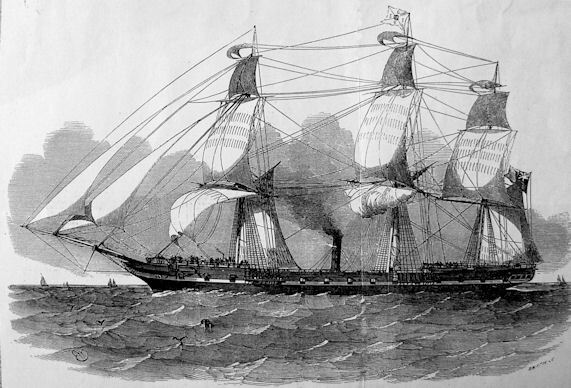 The 慡ir Robert Peel� was immediately dispatched to the Bay with the requisite supply of fuel. 1st October 1853. Arrived at Cape Town having left Saldanba Bay early in the morning. October 1853. Sailed from Cape Town. 18th October 1853. Sailed from Mauritius. 17th November 1853. Arrived at Mauritius. 16th December 1853. Sailed from Calcutta for Southampton. 20th December 1853. Sailed from Madras. 24th December 1853. Sailed from Point de Galle. 5th January 1854. Sailed from Mauritius. 18th January 1854. Arrived at Cape Town. 21st January 1854. Sailed from the Cape of Good Hope. 30th January 1854. Sailed from St.Helena. 3rd February 1854. Sailed from Ascension. 14th February 1854. Sailed from St.Vincents. At St.Vincents she met with 'Lady Jocelyn' which could not load up with coal until she had finished. 26th February 1854. Due to arrive at Southampton from the Cape of Good Hope. 27th February 1854. Arrived at Plymouth from India, with about 50 passengers and a general cargo. 27th February 1854. Due to sail from Southampton for India. 28th February 1854. Arrived at Southampton from Plymouth. 14th March 1854. The 'Propontis' is due to sail to India in place of the 'Queen of the South'. 4th April 1854. Sailed from Southampton for Port Phillip and Sydney, with 90 passengers. Captain Norman. The first steamer of the company on this service. 15th July 1854. Sailed from Sydney and Adelaide. 22nd July 1854. Sailed from Melbourne for Southampton with fifty passengers and 40 chests of indigo, 354 bales of silk, 182 chests of lace dye, 3300 bags of rice, and 153 packages of sundries. 29th September 1854. Sailed from St.Vincent. 13th October 1854. Arrived at Southampton from Melbourne. She had on freight �7,344 in specie, besides a miscellaneous cargo, consisting of 63,274oz of gold dust, �0 in jewellery, five casks of tortoiseshell, ten tons of copper, 31 bales of wool, and 50 packages of sundries. 1st November 1854. Due to sail with troops from Portsmouth for the East. 21st November 1854. Disembarked 800 Guards at Balaklava. 5th December 1854. Arrived at Balaklava with Tucks on board, but was sent on to Eupatoria to disembark. 31st December 1854. Arrived at Liverpool with sick from the Army. Number on board 253, 10 died on passage. 15th January 1855. Off the port of Liverpool for Constantinople. 7th May 1855. Sailed from Genoa. 27th July 1855. Arrived at Southampton, Captain Beale, from the Black Sea with 8 passengers. 13th September 1855. At Southampton under repairs for the conveyance of shell, huts etc., to the Crimea. 6th October 1855. Sailed for Plymouth, after a delay of considerable time in consequence of her being unprepared for sea and the non-arrival of her passengers. 8th October 1855. 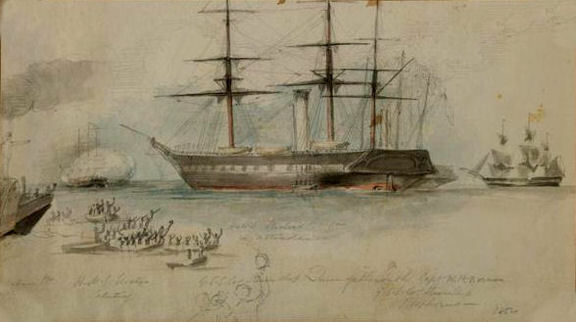 Arrived at Devonport and embarked about 100 men for the Crimea. 9th October 1855. Sailed for the East. 17th November 1855. Sailed from Balaklava for Constantinople. 19th November 1855. Sailed from Constantinople for Malta. 25th November 1855. Arrived and sailed from Malta for England. 7th December 1855. Arrived at Southampton from the Black sea. She brings invalided officers and men from the seat of war, plus, 509 casks and cases of condemned ammunition, 28 tons of 13-inch shell and shot, 31 addressed packages, four mail bags and two cases of tobacco, unclaimed. 21st December 1855. Sailed from Spithead with 709 troops and 24 officers plus warm clothing for the troops. 31st December 1855. Passed through the Straits of Gibraltar. 5th January 1856. Arrived at Malta. Embarked the men the same day. 9th January 1856. Sailed from Malta for Southampton. 12th January 1856. Spoke with the 慉lma�. 14th January 1856. In the Straits of Gibraltar. 20th January 1856. Captain Beal, arrived at Southampton from Malta. February 1856. She was involved in a deal with French buyers, the price included stores as well. 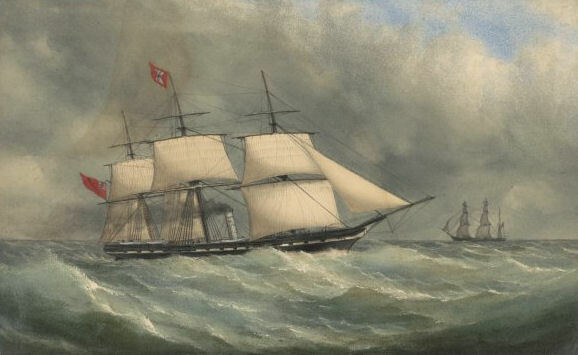 The Societe Generale des Clippers Francais paid a deposit but when they defaulted on further payments the transaction fell through leaving the ship in the hands of the General Screw Steam Shipping Co.
18th February 1856. The General Screw Company have received an intimation that the Government might require the use of their four large ships now lying in Southampton Docks � the 慍alcutta�, 慉rgo�, 慔ydaspes�, and 慟ueen of the South�, for the transport service. The company are acting upon the intimation, and the vessels are being prepared for sea. 3rd March 1856. Lying at Southampton engaged in the transport service. 30th April 1856. Transport ? 135, sailed from Southampton for the Crimea to bring home horses and troops. 29th May 1856. Arrived at Malta from Balaklava. 31st May 1856. Sailed from Malta for England. 1856. Captain Hyde joins the 'Oneida', the first ship of a new company called the European & Australian Co.
4th June 1856. Sailed from Marseilles with troops. 28th June 1856. Sailed from Southampton, Captain Beale, for Cork and Dublin with 85 men, officers, and horses of the 17th Lancers, and 215 men, with officers, and 133 horses of the 1st Royal Dragoons. She will return to Portsmouth for the purpose of conveying to Ireland more horses and troops. June. (Late) Put into Queenstown for water. 30th June 1856. Arrived at Queenstown to disembark troops. 2nd July 1856. Arrived at Kingstown at 6 p.m. to disembark troops. 5th July 1856. Arrived at Plymouth from Queenstown with 230 men and horses of the 11th Hussars, under the command of Captain Foster. They will proceed to Exeter on the 7th. 13th July 1856. Arrived at Spithead from Ireland. 24th August 1856. Arrived at Gravesend from Genoa. 6th March 1857. Owned by the European and American Steam Shipping Company. 25th April 1857. Sailed from Bremen for Southampton. 29th April 1857. Sailed from Southampton. 27th May 1857. Due to sail from New York, Captain Beal. 21st June 1857. Was in collision with the brig 慉talanta�, of and from Southampton. The brig received considerable damage, and sunk; crew saved, except one boy, and taken to Southampton by the steamer. 22nd June 1857. Arrived at Gravesend about 11 o抍lock from Bremen for Southampton and Sold. 22nd August 1857. Been surveyed and chartered by the East India Board for the conveyance of troops from England in the Victoria Docks. She has undergone a course of effective alterations and repairs of engines and boilers and sailed for Portsmouth. 30th August 1857. At Portsmouth, the embarkation of the 34th Regiment for India took place. 1st December 1857. Arrived at Madras and sailed for Cannanore with troops. 1859. Sold to The Anglo-Luzo Brazilian Steamship Company. 1st October 1859. Renamed 'Milford Haven'. 3 decks, masts, brig rig. 3rd October 1859. Sailed from Milford Haven for Lisbon. 22nd December 1859. Arrived at Milford Haven, from Brazil via Lisbon. She encountered a severe gale, amounting almost to a hurricane, when off the Scilly Isles. She brought a fair complement of passengers and goods to Lisbon, and from Lisbon a large cargo of fruit. Her freight list from Brazil included 1,000 bags of coffee for London, some opchilla weed, several packages of diamonds, and considerable specie. At Bahia the Emperor received the officers with marked attention, went round the ship, and expressed a deep interest in the new line of steamers. 24th February 1860. Due to sail from Milford Haven, Captain Champion, for Lisbon. February 1860. Owned by Suss Brazilian R. M. S. N. Co.
4th July 1860. Arrived at Plymouth, from Queenstown, with 230 men and horses of the 11th Hussars, under the command of Captain Foster. They will proceed to Exeter on the 5th. 18th December 1860. Ship taken over by the East India and London Shipping Company. Renamed 'Queen of the South'. 11th December 1862. Arrived at the Cape of Good Hope. 15th December 1862. Sailed from the Cape of Good Hope for the East Indies. 27th February 1864. Owned by the East India and London Steam Shipping Company, and will sail between Plymouth, Cape of Good Hope, Madras, and Calcutta. 27th December 1864. Sailed from Calcutta. 7th January 1865. Sailed from Madras. 12th February 1865. Sailed from the Cape of Good Hope. 29th March 1865. Arrived at Plymouth and landed a few passengers then proceeded to London with �00 of specie. July 1865. Owned by R. W. Pelly. 19th September 1867. A large quantity of shot and ammunition were sent up in barges from the Royal Arsenal, Woolwich, to the London Docks, to be shipped on board for the service in the Abyssinian campaign. The 400 32-pounder shot is for the purpose of sinking the dead into the sea. 22nd September 1867. Inspected at Deptford before being used as a hospital ship for the troops in the Abyssinian expedition. 23rd September 1867. Passed Deal from the west for the north. 1st October 1867. Sailed from London for Bombay. November 1867. Owned by S. Boult, Liverpool. 2nd November 1869. Owned by Merchant Trading Limited, Brown抯 Building, Liverpool. 1870. New engine fitted. 55� x 55� x 39� by J. Jack, Liverpool. 7th January 1871. Sold to Foreigners. Engine removed. 12th January 1871. Re-purchased and re-reg as the 慚alta� of London, had machinery removed. 1377 & 67/100 tons. October 1884. Owned by W. H. Corsar. Arbroath. 15th October 1885. Sailed from Antwep, Captain John Moulton. Owned by W. T. Dixon, of Liverpool. 23rd November 1885. Wrecked on Ocean Beach, New York.